It feels as if I’ve known Brad and Jess forever. I have at least know them since Bradford, who we used to refer to as Little Brad, was around my Noah’s age. He recently had a birthday and is now in the double digits . . . not so little anymore. My parents and Brad’s parents met as “neighbors” at the beach (they had condos in the same building), and they spent several summer weekends soaking up the sun and good company in the sand in Ocean City, Maryland. And whenever I go to the beach, even though my condo is 17 streets away, I always end up on the beach by their condo because their street just has this amazing sense of community. That is where I got to know Jess, Brad, Bradford and Josie. I have loved watching these kids grow. I remember the days watching Bradford run around the beach being Spiderman, shouting “pew pew” as he shot his spiderwebs from his wrists and the days when he became fascinated by weather systems and could tell us all about tornados and hurricanes. And more recently, I can recall the talent shows, listening to Josie belt out songs on the beach to an audience of at least 20 or 30 people. When Jess texted me this winter and said that they would like to have family photos done, I was excited. 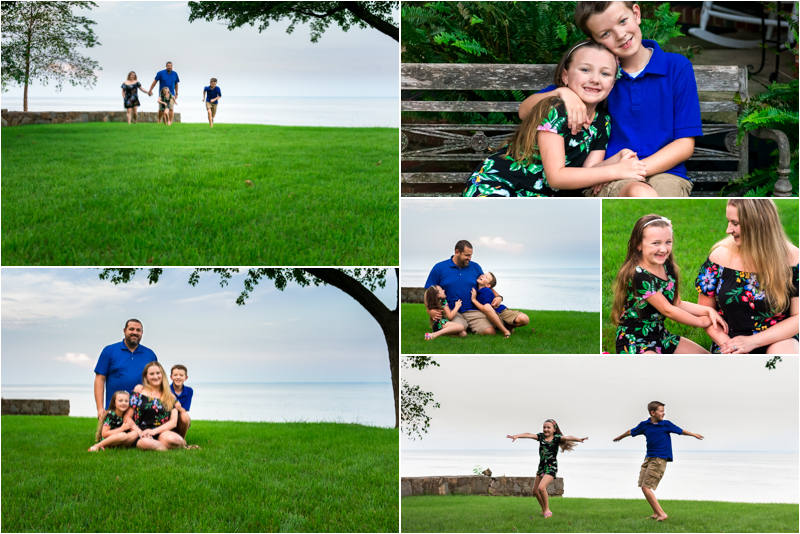 My excitement grew when she shared that they hadn’t had family photos done in the past 10 years. There’s something about creating and capturing these moments for a family that has not treated themselves to this in so long, it just makes my heart sing. We waited until the weather warmed up, and bounced around some ideas for locations. We both live in Pasadena, Maryland, so finding a local location for their family photos would be ideal. There was some rescheduling due to unforeseen circumstances, but in the end we ended up in Brad’s brother’s backyard (chosen for it’s amazing view) on a warm August evening. We moved around the yard, capturing some posed portraits and some in between moments, played a few games of red light green light (Bradford is extremely fast! ), and shared some tickles and lots of laughter. I asked Josie what she likes to sing these days and was very impressed by her beautiful voice when she sang Imagine Dragons for me. We wrapped up with some crazy fun games of helicopter, which had the kids pretty dizzy (and hopefully tired out for the night). At the end of the day, I had fun and I know they had fun, and I feel really blessed to have been able to serve them by providing family photos that I know they will treasure.